Man, this line. This line! Marvel Legends absolutely killed it in 2017, and the Thor: Ragnarok wave series from late in the year might be the best of the lot. The selection of characters covering not only the great little film, but also the current comics and this guy, is an excellent spread, and honestly I wasn't even that chuffed for Ares until Rustin pointed out that he was previously a Build-A-Figure, thus saving me from having to chase down pieces from a past line. But then I got him in hand, and he's awesome! Crusaders of the realms, these warriors wield ancient weapons in their fight to bring balance to the kingdoms from which they hail. It speaks to the tremendous quality of this line of Marvel Legends that this figure, one of the regular toys from the line, was previously a BAF, and it really shows in his size. 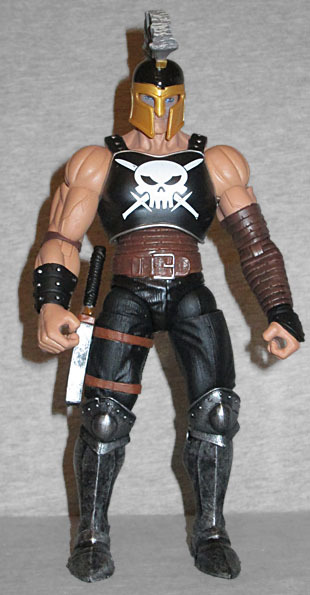 Even without his helmet he's huge, at 7⅛" tall, but perfectly in scale with his Marvel Legends brethren. Despite (apparently?) not having a direct link with the other Thor characters here - film cameo notwithstanding - he suits perfectly, being a big muscly bruiser character with oversized weapons to go with his oversized pecs. As with the previous release, he's painted with his Ares insignia on his chest, and the rest of him is painted accordingly. As I understand it, there are differences here to his previous appearance, but based on the art I found of him in the comics this is very accurate. The major difference between this release and the last one is the paint. 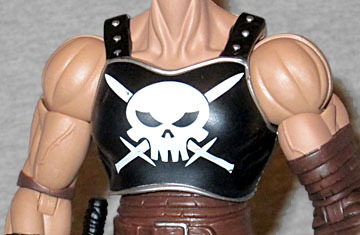 On this release, his breastplate is black rather than grey, and the skull-and-crossed-swords symbol on his chest is larger. His pants are black, making for a stronger contrast against the brown armor on his stomach, but that thing on his left hand is supposed to be part of the same set-up as covers his arm, so why isn't it the same color? And I guess he's shaved his right arm, since there's no more hair painted on it. As a large Marvel Legend he's very nicely articulated, with ball-jointed shoulders, neck and legs, then the additional joints at the chest, biceps, elbows, wrists, thighs, thighs, knees and ankles. What impresses me the most is despite the bulky size all of these joints are very firm, which means he holds up and has plenty of play and poseability in him. This is excellent quality stuff, and amazing value at the current SRP. And honestly, it shows you how close Hasbro was to modern standards even the better part of a decade ago - they hadn't yet figured out that they should put a hinge in the neck, but the rest of it is right up there. Beyond the Build-a-Figure piece from this series' Gladiator Hulk (or whatever his name is), Ares features four great accessories. The first is his helmet, fully removable and detailed, which reveals the God of War's sneering face underneath. 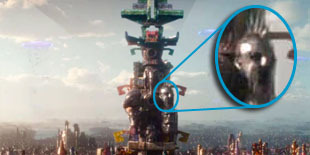 The detail here is great, both on the helmet itself and said sneering-face, which has a great powered-eye look to it. 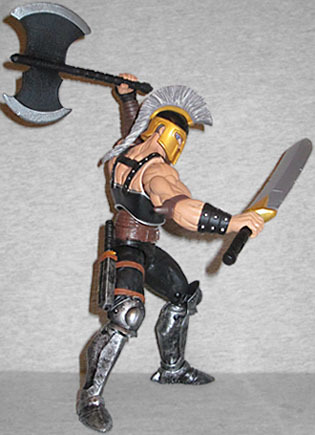 Next, Ares has two huge weapons, an oversized axe, and an oversized sword. The sword in particular is hilarious to me; it's taller than most Legends! I like both of these, despite their simple paint, they're very striking [in more ways than one! COMEDY!! --ed.] 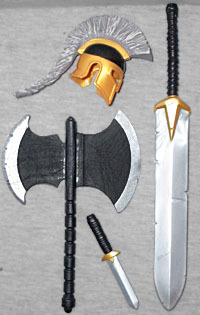 They're made of softer plastic than I'd like, which means the tall sword might bend, but this isn't as problematic as it might be in a smaller weapon, and it means that Ares can hold and swing it without risking toppling due to potentially heavy weaponry. The axe is new to him: rather than something that came with the old BAF, it's a repaint of a weapon that came with Thor a decade ago. I did not expect to love this guy as I do, but he's really something! It's great to get such an awesome toy as this, and immediately be interested enough in chasing up the character to know more about him. And that's Ares! A tremendous toy, all the better for appearing in this great little series, which may or may not be a shoo-in for Toy of the Year's Best Line? Tune in to find out (two days ago, when the feature went live! ).